An interesting subject matter that just moves a little too slowly as it often seems more like a documentary than a narrative film. 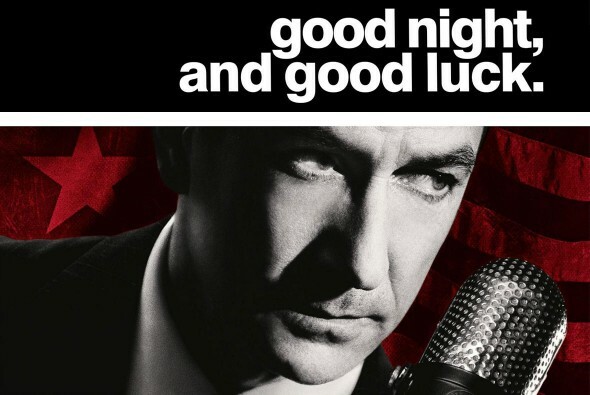 Good Night And Good Luck is George Clooney’s second directorial effort following the forgettable movie confessions of a dangerous mind. it’s also what is very much a george clooney movie, all about politics and history and not caring if it is confusing or wordy or tough to follow. there are plenty of clooney movies that need to be seen a second time, just to understand them. syriana and michael clayton and the good german are all some of those films. the movies turn out to be pretty great, but you wouldn’t know it from a first viewing. at that point, you’re struggling just to keep your head above water and make sure you’re following the plot. The historical period is certainly interesting. the time was the red scare, a period of american history where everyone was afraid that their neighbors were communists. senator joseph mccarthy not only heightened that fear, but he escalated it, claiming that a good portion of the people’s representatives in government were actually members of the communist party. there’s no doubt this time period and paranoid atmosphere could be very cinematic if handled right. something like v for vendetta, where one man must stand up against the governing authority. there was a good de niro movie about the black listing in hollywood, called Guilty by suspicion that got more into what this was doing to people’s lives. Good Night And Good Luck isn’t interested in that. Instead, it is interested solely in the situation around the newsroom. news reporter edward murrow (david stratham) thought that what mccarthy was doing was wrong and he stood up to the senator with news reports about how ridiculous these accusations were. Good Night And Good Luck is thE story of how murrow went about doing this. the movie takes place entirely in either the meeting rooms at the news station, the recording studio, or the jazz club where the reporters like to go for drinks. it never goes home with them or shows what they do away from work. we never even learn of murrow has a wife or family. understandably this is intentional. this movie doesn’t want to be about the man, it wants to be about the situation in the newsroom. but is that really enough for a feature film? in this case it’s not, as the movie constantly has to go back to the jazz club and watch performances by the local band, just to help fill the time. sure, they can justify it by saying that those scenes showed off the time period or created atmosphere, but the reality is there isn’t enough material here for a full movie. now the issues on screen are certainly enjoyable. there are three big ones. first, murrow and his producer fred friendly (clooney) take on a story about an army soldier who was kicked out of the army because his father read a magazine that had to do with communism. the soldier was given the choice to either denounce his father or else be kicked out, and so he made his decision and the army sent him packing. murrow runs the story and we get a cool scene of two army officials coming to see friendly to talk to him about the story. that scene is great because it addresses the problem where people are making decisions or speaking on behalf of the people who make decisions, when they don’t even know the evidence. friendly is asked to have the station not run the story because he doesn’t know the evidence. but they won’t show him the evidence. it’s sort of a catch 22. and then he asks the men who come to see him if they even know what’s in the evidence envelope. no answer. After this, it’s time to take on joseph mccarthy himself. unfortunately the movie actually gets less interesting here. maybe it’s because the soldier story actually felt personal, whereas mccarthy is just a name of a man shown to us on old black and white reels of footage. Murrow makes some claims about mccarthy. then mccarthy comes back and makes some claims about murrow. then murrow gets on the air and denies those claims. none of this is all that special. the movie wants to be too artistic and seems to care more about style than substance. the black and white was unnecessary and may have even hurt the film. i understand that it was used so that the mccarthy reels could be blended into the picture and feel current, but because the movie was shot in black and white, a lot of sacrifices were made for the purpose of art rather than the purpose of storytelling. there are constant shots of people smoking, with the smoke flowing through the air, for example. this is a staple of film noir and the reason for it is because traveling smoke looks fantastic in black and white movies. but they needed to spend less time worrying about the look and more time worrying about the story. The movie is enjoyable because it is different, but it could have certainly been a lot better. 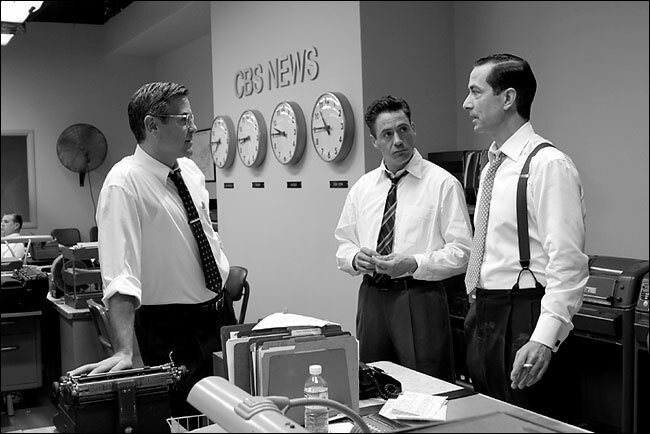 i like seeing a movie about the newsroom and the people who work there, but the murrow vs mccarthy situation isn’t made to be as tense or exciting as i’m sure it was. instead, we care more about watching the plights of characters like the ones played by robert downey jr and patricia clarkson, who are married and at risk of losing their jobs because of it. there we have real people. mccarthy is just a face on a giant screen. he isn’t as threatening as he should be. this movie could have worked if there was more attention given to making it feel quicker and more exciting. as it is, the movie doesn’t mind being slow and that’s a problem.